Response From Patriot Guard Riders: This patch has been discontinued as the manufacturer has lost the licensing with the government to produce branch branded merchandise and at the current time a new license is to expensive. We apologize for the inconvenience. 4/17/2017 – Is the 5" radius or diameter? 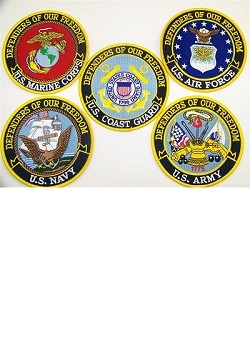 Im trying to put all 5 patches below the large patriot guard triangular patch. Would they fit? . . . Response From Patriot Guard Riders: 5" diameter is the measurements of these small patches. 1/31/2017 – IS the large patch to big for the front of a jacket or is it best suited for the back area of the jacket? Response From Patriot Guard Riders: The large patch is meant for the back of jackets/vest.